A master class in solid & meaningful narrative structure. If story is king, then Whiplash is royalty. Doubling down with fantastic performances from J.K. Simmons and Miles Teller, writer/director Damien Chazelle crafts a tight and tense narrative that never relents and never strays from its central argument. Main Character Andrew Neiman (Miles Teller) practices, practices and practices some more (Main Character Approach: Do-er) as he pursues the goal of being one of the greats (Protagonist, Overall Story Goal: Being). Conductor Terrence Fletcher (J.K. Simmons) stands in Andrew’s way, both logistically and emotionally (Antagonist and Influence Character respectively), hurling cymbals and slapping faces (Relationship Story Domain: Activities, Relationship Story Concern: Doing), all in an effort to break his students down (Overall Story Requirements: Becoming) on their way to being the very best at the Shaffer Conservatory in New York (Overall Story Concern: Being). Natural talent rules the stage (Overall Story Issue: Ability), with Terrence terrorizing students for playing in the wrong key (Overall Story Domain: Psychology, Overall Story Symptom: Accurate) and sabotaging their performances by removing much-needed sheet music (Overall Story Response: Non-Accurate). Driven to create the next Buddy Rich (Influence Character Problem: Cause), Terrence stops at nothing to demean those under his tutelage (Influence Character Issue: Value). Explosive and unwavering in his righteous approach, Terrence relentlessly breaks Andrew down with everything he can’t do (Influence Character Concern: Impulsive Responses, Influence Character Domain: Fixed Attitude, Influence Character Response: Unproven). At the heart of their relationship lies their true problem—Andrew’s determination to be one of the greats vs. Terrence’s determination to send mother-less Andrew home crying (Relationship Story Problem: Determination, Main Character Domain: Situation). Andrew only slows down when he feels he has proven himself worthy of Fletcher’s admiration (Main Character Solution: Proven), an indulgence that only serves to demotivate and ultimately, defeat him. The moment he finds himself up against a new drummer, Andrew kicks in and redoubles his efforts (Main Character Problem: Unproven)—an approach that eventually pays off (Main Character Resolve: Steadfast). Terrence sets Andrew up, preferring to focus on the one responsible for his termination rather than the potential in that one for greatness (Overall Story Problem: Cause) setting the stage for Andrew’s failure. But the future great-one leaves his doting father in the wings, returns to his kit and faces Terrence as the menace he always was (Main Character Signpost 4: Future, Main Character Unique Ability: Threat). Andrew’s performance changes Terrence, to the point where the immovable conductor cares less about being the agent for change and more about improving the effectiveness of Andrew’s set (Influence Character Resolve: Change, Influence Character Solution: Effect). Resetting the cymbal cements this growth of character and insures a fruitful performance (Overall Story Solution: Effect), fulfilling Andrew with the peace of mind that the suffering was worth it (Story Judgment: Good) and guaranteeing his place among the greats (Story Outcome: Success). 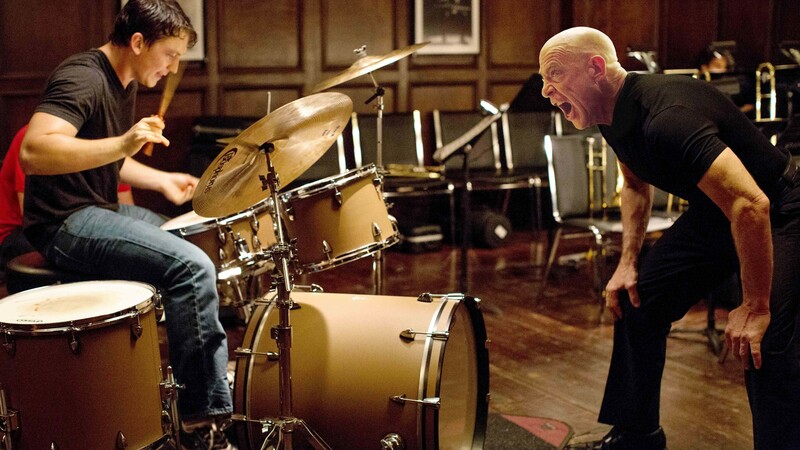 With a narrative as tight and effective as this, Whiplash too guarantees its place among the great films of all time.